THE CANUCKS BANDWAGON IS LEAVING THE STATION…. After watching two preseason games I have a positive vibe coming from our city’s team. One message I get loud and clear was that our much-loved and missed Twin brothers are back. They have been the most noticeable players on the ice for both teams in both games. Of course I say noticed in a positive way. 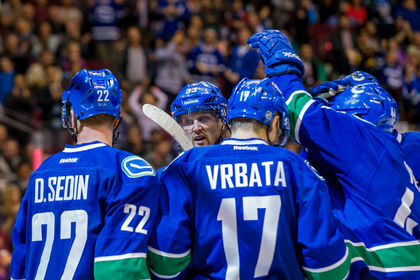 Daniel and Henrik got a new playmate this summer and they seem determined to prove Vrbata is the fit as well as proving they are the first line. They moved the puck around so well that it showed us why they are elite players. 2012/13 was a lockout year that really stole the focus from the players. in that shortened season it was noticeable on many teams other than just the Canucks so I don’t truly evaluate that as a season. Last season (2013/14) was a gong show from the point of hiring John Tortorella as head coach right up until the last and embarrassing loss of the season. I don’t believe Gillis wanted to hire him so tension was set in place from the start and every Canuck fan that hung around long enough saw the inevitable story unfold before our eyes. It was not a pleasant read for it seemed The Twins lacked any sort of interest for the game at all. By the time the season was over I got the feeling that they were going to lay an ultimatum down. The management and coach or the Twins. Not a hard decision to make. I would not be surprised if the Twins had something to do with the departure of Ryan Kesler. I am not saying this is so I am just saying don’t be surprised if it is. Franchise players looking like franchise players which in itself gives the Canucks hope and a chance. Other players feed off of the Twins magic when the Twins light up the ice everyone else on the team benefits from this. Honestly, have you ever seen the team play bad when the Twins play well? Good question isn’t it? I also noticed Nick Bonino all over the puck in the third period as well as OT and Linden Vey is a speedy player that seems to understand the way the Twins play. It is only two games into the season and so far the Canucks have only played division bottom feeders from last year but there is an energy there that you can’t deny. I am very much looking forward to their first match-up with one of the power teams of the Western Conference for truly it will be their first test. 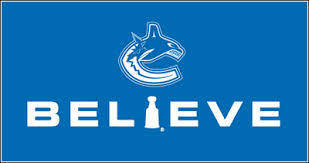 I have much concern for the Canucks blue line as I have seen many mistakes made by the Edler/Tanev pairing. Both guys have struggled and seemed very lost while Tanev in particular is not showing us what got him his job in the first place. The calm and poise that had been present from the time of his first NHL shift seems to have vanished completely. This surprises me because the type of play he was showing us up until now is not the kind of play that can be taught. It’s the kind of talent natural stars possess. He has brains and he has the talent all I wonder is what kind of damage did Tortorella do that may have to do with the creation of this “new look Tanev”? I pray it’s not permanent. Edler has not helped in the task of settling things down in the Canucks end. I will say towards the end of the Canucks Saturday night tilt vs the Oilers he was throwing his body around quite a bit but earlier on he looked awful. He looked really bad vs the Flames on Wednesday and I find myself praying that this is a temporary thing for him , alas, I prayed last year as well to no avail. 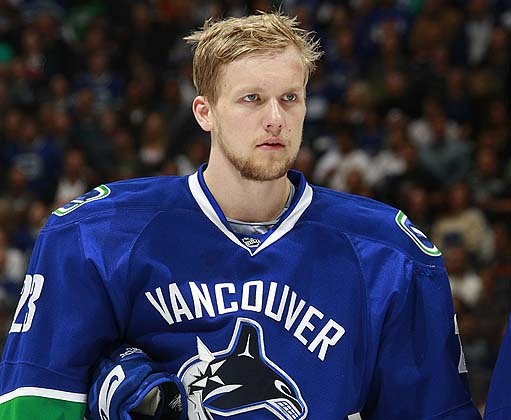 I have been a very big supporter of Edler but I am getting the feeling I may need to prepare myself mentally for his possible departure because GM Jim Benning will not hesitate to move him if his play stays this way. I did not notice Luca Sbisa much which is a good thing for a defense-man. He did make a few good passes out of the zone and he threw a couple of nice hits so it would appear that he is beginning to settle in. Stanton looked solid and I believe he is probably the most valuable waiver pick up the Canucks have ever acquired so there are some good things going on with the back-end but they do have two problems to fix. Any success they have will taper off if said problems go unattended. The question is how much time do you give the ship to right itself? My last opinionated topic involves a questionable signing which hasn’t made me feel very confident about our goaltending. I felt more confident seeing Eddie Lack in net playing for a crappy team last year than I do watching Miller play behind a greatly improved team. I don’t know what it is but I am not confident he can “hold the fort”. It’s almost like the feeling I got when I knew it wasn’t going to be a good night for Luongo. Every time the opposition came down on the attack my shoulders tightened and I cringed until the puck turned back the other way. Those were very stressful games to watch and I get the same feeling with Miller. Potvin, Irbe and Dan Cloutier had a way of making feel like that too. Sixth sense? I don’t know but I do know that particular feeling is rarely wrong. On the bright side Miller did make a couple of timely saves on Saturday night and if the win is on the board I guess it doesn’t matter how many goals go in against. Again I have to ask the question, how long do you give him? This is something only Benning and Linden can answer and I have something that was absent around this time last year…. Faith in my hockey team’s management. Until next time readers and fans, may visions of cycling Sedins with a shot of Vrbata fill your dreams. This entry was posted in ALL THINGS CANUCKS and tagged Canucks Bandwagon, Sedins, VRBATA. Bookmark the permalink. 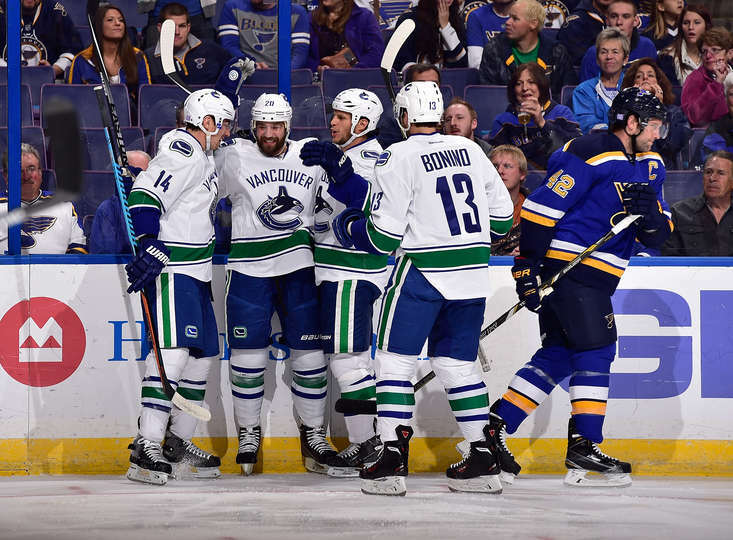 CAN THE CANUCKS TAKE POSSESSION OF A PLAYOFF SPOT? answer to that famous power play question. Do we have a number two unit? Unfortunately that is another question in which I have no definite answer and I think only time will tell us. The Kesler to Anaheim trade is the biggest investment as far as bodies go. The question is was it a good trade? 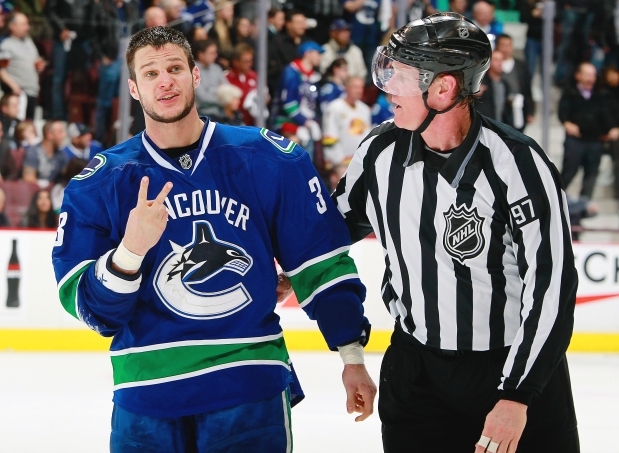 Bonino, and Dorsett look good as for Sbisa I think the jury will be out for a bit on this one. He hasn’t played particularly well as far as preseason goes, in fact pretty terrible. He constantly looks lost, makes forced decisions and doesn’t really give himself any room to move. He misses checks often and all around I can’t say he’ll stay here if it continues. I mean really, we could put AHLberts (not a typo) back in his spot and it doesn’t look much different other than size and meanness. That decision goes to AHLberts unfortunately.The Canucks need toughness on the blue line, a need for a few years now, to compete in the division they are in. Sbisa is not that toughness they need. Bonino has to know that he is not guaranteed the second line center job, right? I am not saying he has played bad but I do hope he brings a little more to the main table than he did to the appetizer table. I am still real hungry and I truly hope he is too because the Canucks as well as Bonino’s job are in trouble if he isn’t. Every single team in California has size, grit and skill which is why they stand in the top three in the Pacific Division. The addition of Dorsett will add that element to the fourth line replacing some of what Kesler took with him to Anaheim. He does have speed and likes to hit and he has not looked out of place at all. Now we get to Linden Vey who has looked good so far, he has the speed to compete at this level and is a fantastic third line addition. I hope Vey replacing Garrison on the power play point is not an experiment but a long term fixture. 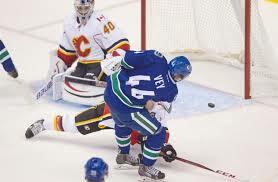 The Canucks power play was a key to their past success where Vey will contribute. He can play center or wing although I have a feeling the wing is where he’ll end up playing with Horvat. This was a good acquisition for what they gave up to get him. One question that I believe has been answered is “are the ‘Kids’ good enough to make it this year?” It appears Horvat is and one out of three ain’t bad, eh? Horvat’s situation is a little trickier being too young to play in the AHL. One thing I do know is we sure got a pleasant peek at a future Canucks first or second line and that future is not too far away. Overall I think the Canucks players need to embrace a possess the puck style to progress to the next level. They lack in size but have an edge in speed that they could use to win some games. The new guys they acquired all seem capable of this style. Are they soft? Maybe a bit but if they can use that speed they have to avoid some checks that size may not matter. If they stick to the puck possession style that seems logical for way the team is constructed they should compete. Have we heard this before? Of course you all realize I am talking about the regular season right? This entry was posted in ALL THINGS CANUCKS and tagged Pacific Division, POSSESSION KEY FOR CANUCKS?. Bookmark the permalink. With a new head coach in Willie Desjardins, the Vancouver Canucks are taking a different approach in the defensive zone than they did under the last guy (who shall remain nameless because I always get in trouble from the commenters whenever I bring him up). This entry was posted in NBC PRO TALK and tagged DIFFERENT D APPROACH. Bookmark the permalink. This is a poem about someone (I think you can guess who) that I wanted to share with people. I wrote it a few months ago after I completed reading a book on his life starting at a very young age (and I have read many). I have not written any poetry since I quit drinking 15 years ago. So I was surprised at how easily this flowed out of my pen. I entered a contest and it has made it to the semi final as well as being published in a book of poetry. so without further ado here it is. 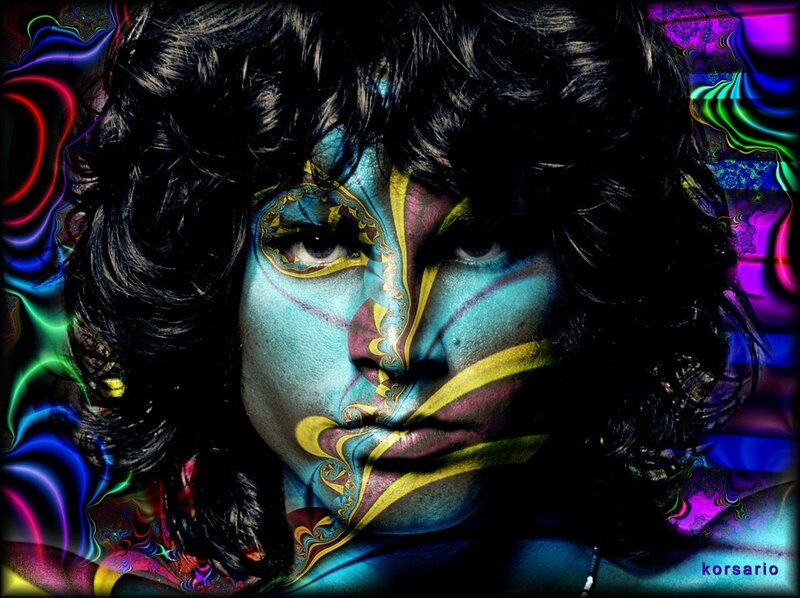 His soul belonged then to the infamous Lizard King, he was no longer Jim. he “broke on thru to the other side” at death. This entry was posted in MUSIC RELATED and tagged MUSIC TO GUIDE OUR SOULS, SO LONG JIMMY. Bookmark the permalink. SO THIS MEANS WE KNOW WHO OUR TWO GOALIES ARE TO START THE SEASON..
Goaltender Jacob Markstrom, who was a part of the Roberto Luongo trade, cleared waivers Saturday. Markstrom, 24, who appeared in four games for the Canucks last season following the trade, will now likely report to the Utica Comets of the American Hockey League. Four teams were reportedly interested in the Swede’s services, but he was not claimed prior to the noon eastern time deadline. Following the Canucks 3-0 victory over the Calgary Flames Friday night, general manager Jim Benning announced the team had reduced its’ roster by 11. First rounders Brendan Gaunce (2012) has been assigned to the American Hockey League’s Utica Comets while Jake Virtanen (2014) was returned to the Calgary Hitmen of the Western Hockey League. This entry was posted in NBC PRO TALK and tagged MARKSTROM CLEARS. Bookmark the permalink. TIME FOR CHANGE? TWO YEARS OVERDUE…. Stars former head coach Willie Desjardins was made with a young player’s ring to it. You have to think they plan a slow re-build with this move by the two new Canuck kingpins. Desjardins has no prior NHL coaching experience although he has been successful in all levels of hockey that he has coached . A few players in the line up and even our team’s President know Desjardins from his Medicine Hat coaching days so again there is a familiarity already in place that would normally take President, GM, coach and players at least half a season to develop. I think this in itself is a valuable asset. Among all this work Benning still managed to sign two UFA’s to contracts. Goalie Ryan Miller (the jury is still out on this one) and right wing Radim Vrbata who is still an experiment with the Twins but has been noticeable in all the preseason games he’s played. In fact all of the new acquisitions have been noticeable in the preseason and I realize no season is completely judged by the few games that precede it but there has been an excitement in the air that has been missing for two years which nobody can deny. If this carries on we have hope my fellow Canuck fans, we have have much hope indeed. They promise change and with new faces above, behind and on the bench we can see they are trying hard to keep this promise. Now can they turn this change into a competitive hockey team? That story has 82 pages yet to be read with one promise I can make. I will read them all and I hope you will too. This entry was posted in ALL THINGS CANUCKS and tagged CANUCKS KINGPINS. Bookmark the permalink. The Vancouver Canucks made a trade in the off season acquiring center Nick Bonino, 1 first round, 1 third round pick and a defense-man named Luca Sbisa. To add these pieces to the Canucks franchise puzzle they gave up one of the best second line centers to play in the NHL Ryan Kesler. It is still not one hundred percent clear why Kesler wanted to be traded or if he even wanted to be traded. One thing that is abundantly clear is that Pres. 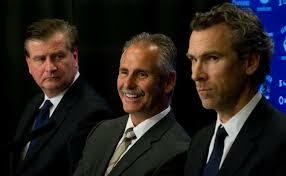 Trevor Linden and GM Jim Benning had no hesitation in moving him. Over time the true details of the story will find their way out of the secret closet and we will know the truth but for now I would like to focus our attention on the defense-man named Sbisa. After being taken 68th in the CHL’s import draft in 2007 by the Lethbridge Hurricanes. Sbisa played major junior hockey with the Hurricanes until he was selected 19th overall in 2008 NHL entry draft by the Philadelphia Flyers. He played 39 games for them in 2008/09 season recording 0 goals and 7 assists and played 2 games for the Flyer’s AHL affiliate the Philadelphia Phantoms before ending off the year in Lethbridge. At the 2009 NHL entry draft Sbisa was traded to the Anaheim Ducks with Joffrey Lupul and 2 first round picks (which were John Moore, 21st overall in 2009 and Emerson Etem 28th overall 2010) in return for valued asset Chris Pronger and forward Ryan Dingle. There was also an option for a third round pick headed to the Ducks but was not exercised as the Flyers did not win The Stanley Cup. In Anaheim, Sbisa did not play a full season until 2010/11. He played 68 games where he got 2 goals and 9 assists for 11 points. He also played 8 games in Syracuse with Anaheim’s AHL affiliate Crunch and had nearly as many points getting 2 goals and 7 assists. Sbisa’s best season with Anaheim was 2011/12 recording 5 goals and 19 assists in 80 games. Of course the following lockout year took forward progress away from a lot of NHL players and teams including our Canucks. Sbisa’s numbers dropped but he only played 71 of 130 regular season games over the next 2 seasons. Truth be told he has not been nearly as highly regarded prospect as he was when drafted by the Flyers in 2008. When it comes to injuries with Sbisa the 2013/14 was not nice to him. He played 30 games with Anaheim due to injuries and conditioning stints. In the preseason of last season he sprained his ankle in a game versus the, then Phoenix and now Arizona, Coyotes. He missed 12 regular season games. Sbisa returned November 4th played 9 games and tore tendons in his right hand in a fight with Tampa Bay Lightning defense-man Radko Gudas. This injury kept him out until Late January. In March he injured his knee which cost him another week’s worth of play. All in all Sbisa missed 52 games. Mark Fistric appeared to have worked his way into his spot which resulted in some press box time for Sbisa. Fortunately for Sbisa further injuries to Anaheim’s defensive corps allowed him to get back into the line-up. I am sure if you asked Sbisa he would say he’d love to have a reset button for last year. There is speculation that Sbisa has upside. He has good mobility, can move the puck. The downside is that he lacks greatly on the physical side of the game but from what I have seen he likes to hit and has had only one bad season of injuries. Mobility is definitely an asset if Vancouver sticks to the puck possession style they are preaching right now. He can log minutes and play on the power play. He has offensive ability to be tapped into and at 6 foot 2, 198 pounds he is not a small man by any means. Will he make an honest contribution is yet to be seen. He is 24 years of age so being young the opportunity is there. Another player feeling like they need to prove themselves. I say again this often provides enough motivation. I ask though, does he have what the Canucks need? We will soon see. 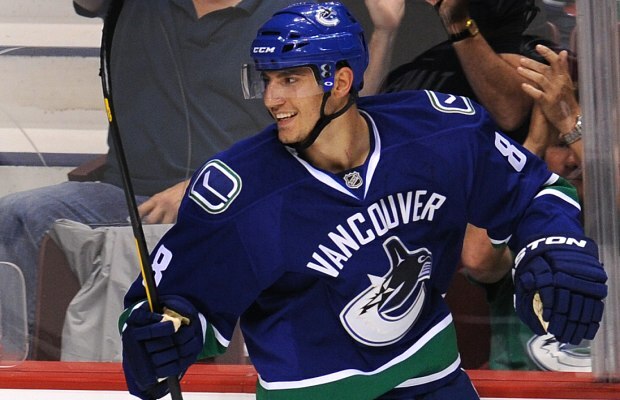 It would be nice for Sbisa and the Canucks if he picked this year to break out. We will accept with open arms. This entry was posted in ALL THINGS CANUCKS and tagged D-MAN NAMED SBISA. Bookmark the permalink. I have to admit when GM Jim Benning signed Ryan Miller to a contract this past off season I was scratching my head a bit. I was thinking why would the Canucks spend six million dollars on a goalie that hasn’t really made any sort of real statement in the NHL? His save percentage (SV%) has been over .900 in all of his twelve seasons but his goals against average (GAA) has been a mediocre 2.59 goals per game. This tells us that the team he plays goal for needs more than 2.5 goals per game to stay competitive consistently. One problem our Canucks have had is scoring goals. So I ask, does this makes sense? He does have very good regular season stats in the win/loss column having 294 wins, 194 losses and 29 shutouts in his career but his last season, split between Buffalo and St. Louis, wasn’t very good. He had 15 wins, 42 losses in 47 games as a Sabre with a .923 SV% and a 2.72 GAA. In St. Louis he had 10 wins, 9 losses with a .903 SV% and a 2.47 GAA. St. Louis picked him up at the trade deadline last year to be their saviour and it didn’t work. Not to put all the blame on Miller’s shoulders but he had a paltry 2 wins and 4 losses with a .895 SV% and a 2.70 GAA so he certainly did not shine. I will need more time to observe this project but at this point I see it being the only questionable move the Canucks made this summer. Another move made by the previous reign of power (if you can call it power?) was the trade sending Roberto Luongo to Florida in return the Canucks got Jacob Markstrom and Shawn Matthias. Markstrom in an unproven goalie in the NHL. Drafted 31st overall in the 2008 entry draft by the Florida Panthers he has not been very successful in all levels of his career. Something I have noticed in my studies is that he has a 3.00 GAA and a .868 SV% in 4 of 5 seasons played in NHL. He has been the back up in Florida and was acquired to back up Eddie Lack here in Vancouver. Keep in mind the current regime did not make this trade and the fact that they wasted no time signing Miller tells us all they have little or no faith in Markstrom. He has played a total of 45 games with Florida as well as 4 games here after the trade that brought him to Vancouver. He recorded 12 wins, 32 losses in those 45 games with a .868 SV% and 3.00 GAA. I personally do not see any improvement, on a statistics level, to the goaltending position. I will say that Trevor Linden and GM Jim Benning did not create the mess but they are showing a bit of an odd way of cleaning it up. 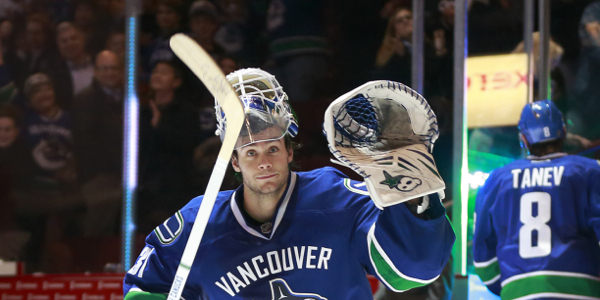 The third factor to the ‘question of the crease’ is the one who has been here through it all, Eddie Lack. The Canucks have been grooming him for a couple of years now and there was a clear and present plan for him to back up Cory Schneider in the eventual departure of Luongo. We all know how that panned out so I won’t rehash it. Lack played in Sweden for much of his junior career. He stole Ed Belfour’s job playing for Leksands IF’s pro team in 2008/2009 and finally made it to Sweden’s premier league Elitserien October 17, 2009. He went on to back up the recently acquired Jacob Markstrom and played 14 games that season. Lack was ranked 9th among European goalies in the 2009 draft but went unselected. Canucks scout Lars Lindgren saw something he liked and the Canucks signed him on April 6, 2010 as a free agent. His years spent with WHL Chicago Wolves were not spectacular but he does show that he has talent and at 6 foot 4 inches, 197 pounds he covers a lot of the net. His performance last season in Vancouver was also not spectacular. Playing in 41 games he had 16 wins 17 losses and 5 OT/SO losses with a .912 SV% and a 2.41 GAA. It wasn’t terrible either in light of how he got the job as starter. I think with a little more time The Stork will emerge as the Canucks number one goalie. The defenseman named Sbisa will be the second part of this instalment coming very soon. We all need teasers right? I know our Canucks keeping teasing us. Until next time, may the Canucks be with you…. This entry was posted in ALL THINGS CANUCKS and tagged THREE GOALIES?. Bookmark the permalink.